Driving on adrenaline at 4 am towards the Viera Wetlands of Melborne (just south of Cape Canaveral) Florida I slowly sip my warm mug of coffee. The moon is full and the skies are clear. As the light begins to creep into the morning I see several white tail deer feeding along the interstate. My quest is an illusive Least Bittern today. This small bird is a resident I am told of the Viera wetlands I am about to visit. I pull into the five small retention ponds of a reclaimed water treatment facility and stop to survey the scene. As the sun begins to rise the number of birds beginning to take wing astound me. The setting moon reflects on the large pond in the center of the wetlands as the dark profile of an alligator glides silently along the still mirror like surface of the water. I drive around the central pond to observe the layout and stop to set up my equipment. Overhead a Great Blue Heron silently glides by. It is just past 0630 and several photographers are already about. One stops to explain his quest to capture a photo of the dew on a dragonfly that are just starting to stir. As the sun begins to rise I see a number of familiar shorebirds. Another photographer with a huge Canon lens directs me to a nest of Green Herons. I see three fledging Herons right where he said they would be and press the doohickey before I notice a pair of eyes only a few feet away staring up at me. As the alligator approaches the bank, I retreat. It is very apparent that one must approach the ponds with caution. The alligator pauses beneath the Heron’s nest and waits in still silence just in case some unwary feathered friend above makes a foray into its lethal range. As I glance towards the east I see a spoonbill winging my way but by the time I raise the camera it is already overhead and soon out of range. My reflex click however does catch the broad pink wings in the morning light. A large doe comes out of the ditch to my left and pauses on the gravel road to see if I will move out its way and hurries by to my right. The creatures great and small are about and before me. A black-bellied duck goes into a slow descent and lightly touches down on a dying palm tree in one of the cell ponds. My quest for the Least Bittern begins as I slowly circle each pond hoping to catch a glimpse of this small bird. A small blue dragonfly deftly balances in front of me on a twig. Intrigued by this small insect I try to capture it as best as my lens can do. My friend Jim would love to be here seeing this I am sure. After several hours of searching in vain for the bittern I decide to leave and head for home. Perhaps another day. A small alligator is sleeping on the bank. I stop and slowly approach it and lie down in front of it. I see a primitive looking eye staring at me thru the lens as it wakens but sits still. I creep forward to within the minimum focus distance of my lens and then perhaps just a bit too close. It raises its head and I slowly back away a few inches. Click. Gotcha before it can get me back. Don’t try this trick at home. Kissing an alligator is not high on my list for today. An Alligator glides along the pond looking for something, hopefully not me! 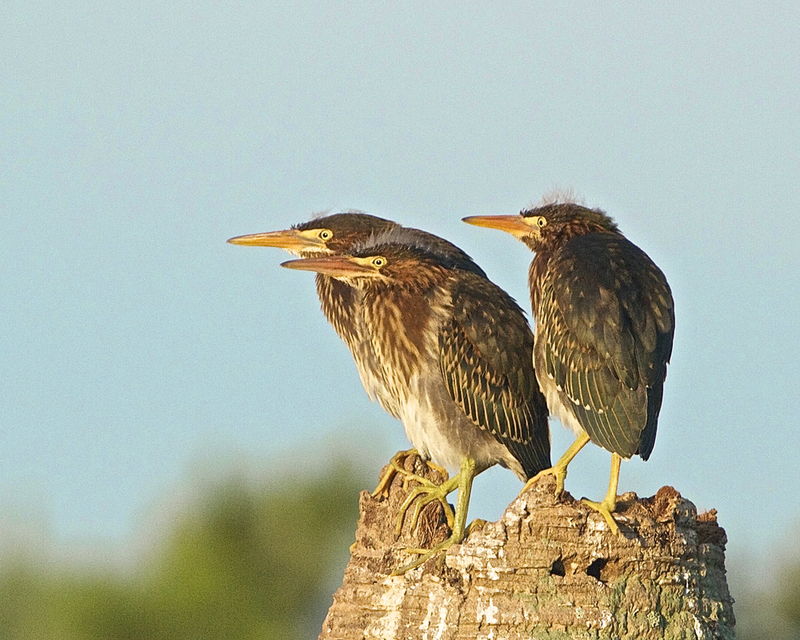 Three fledgling Green Herons ponder the new day. A Black-Bellied Duck touches down on a dying palm trunk. A male Anhinga climbs up a palm trunk to warm in the morning sun. A white tailed deer doe scampers across the road. Broad Pink wings of the Roseate Spoonbill soar overhead. 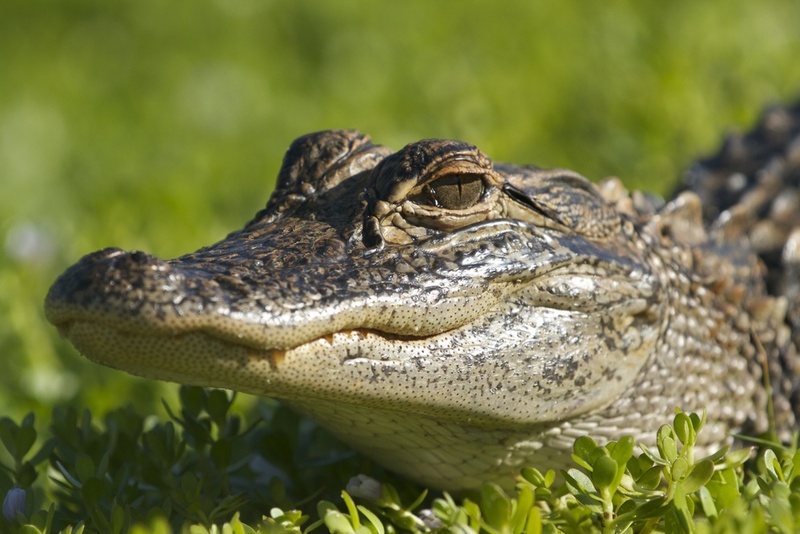 My venture into the closer approach to creatures of creation begins with this small alligator. A much safer dragonfly captures my attention after my search in vain for the bittern. My friend Jim introduces me to the world of the dragonfly on a macro scale. 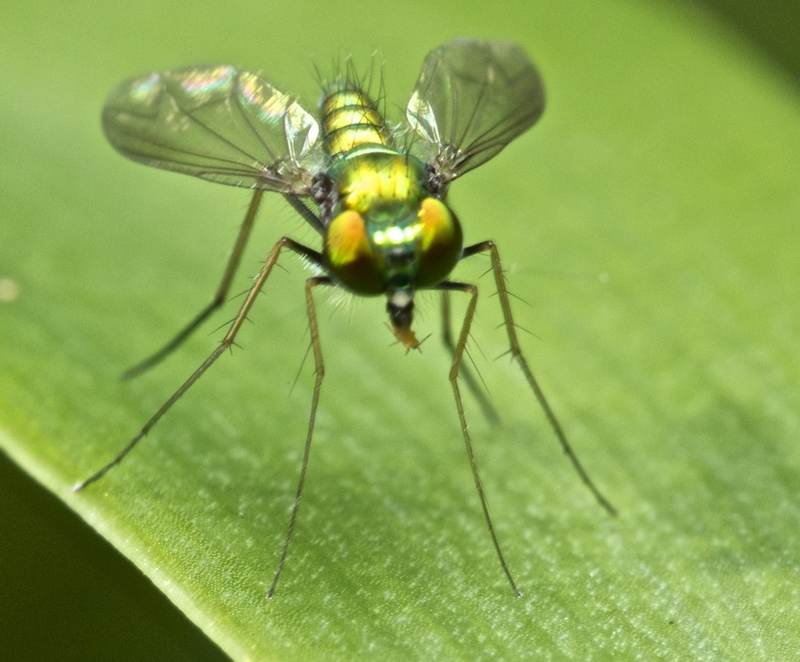 A green fly enjoys a little breakfast tidbit of an aphid. 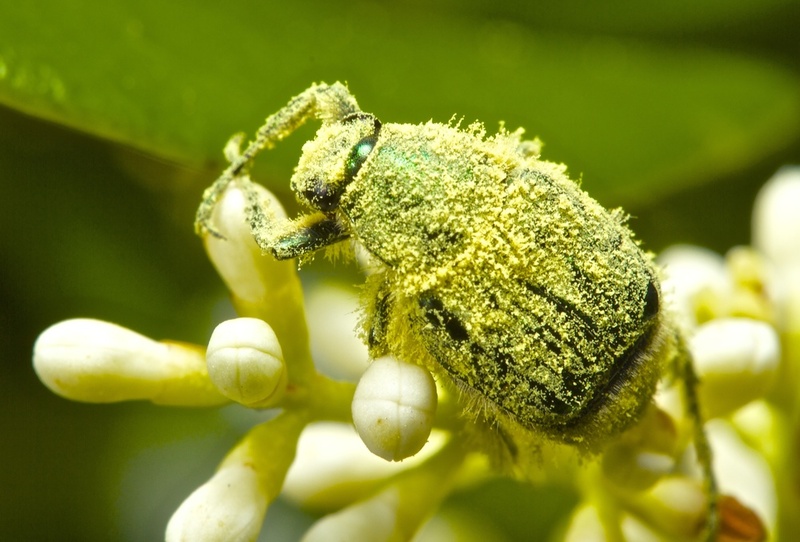 A pollin encrusted beetle or June Bug. He made their glowing colors. Can you find the lizard's tear? It is sorry to see you go, till next time...be blessed.